Lynne Hardy is Associate Editor for Chaosium’s Call of Cthulhu line. Lynne discovered roleplaying games back in the mists of time—or the early 1990s, as they’re more commonly known. The second game she ever played was Call of Cthulhu and, after writing and editing for companies such as Nightfall Games, Cubicle 7, and Pelgrane Press, she returned to the non-Euclidian fold to act as the lead writer, editor, and line developer on the multi-award winning Achtung! Cthulhu Kickstarter project for Modiphius Entertainment. With her tentacle-free hat on, she currently edits the Blue Rose RPG line for Green Ronin, and contributed to the award-winning Seven Wonders RPG anthology from Pelgrane Press. 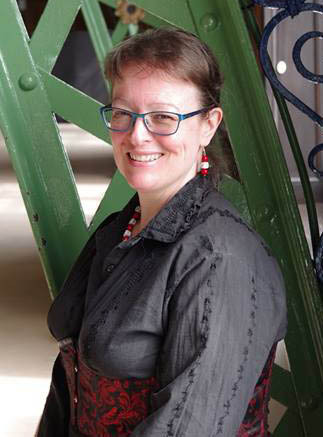 She is also the designer of her own ENnie-nominated steampunk game: Cogs, Cakes & Swordsticks. Lynne doesn’t like horror films much as they’re far too scary, but she is rather fond of tea and fountain pens.